It’s official: Tara’s a quilter! 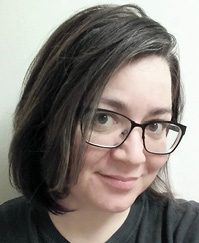 Martingale’s marketing graphic designer is back with the final installment of her quilting saga, giving us a peek into the mind of a beginning quilter. We’ve shared her highs and lows, her troubles and triumphs—and today is most certainly a triumph. See Tara’s finished quilt below, and remember to leave your congratulations in the comments! You can read Tara’s first post here, her second post here, and her third post here. Just one last binding edge to complete! First I want to step back and talk about the binding. I wasn’t sure what fabric to use for the binding. I had used 23 different colors on the front, and while it was important for everything to match somehow, I thought black, white, gray, or another neutral might contrast too much with the rainbow. I wanted it all to blend while still being interesting. I kept going back to a few of the more rainbow-hued prints from the bundle of Moda Bonfire Batiks I started with. I hadn’t used any of those on the quilt front, so it seemed a little out of nowhere—but then I remembered that’s how it feels when something is so crazy, it just might work. After all, I’ve noticed many of the professionally made quilts I’ve seen in my time at Martingale often have something that seems random about them, but is, in fact, perfect. 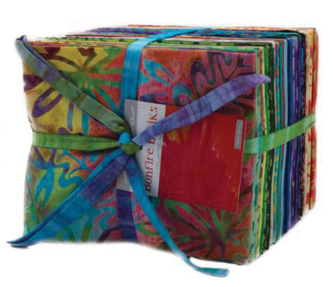 So I decided to make both a pieced backing and a pieced binding from three solids and three batik prints. 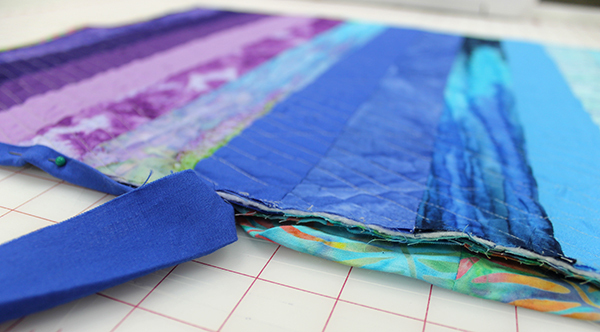 Since I had limited scraps left, I knew I wouldn’t be able to make the binding with equal amounts of all fabrics. I decided not to worry about it and let the binding be random, changing fabrics as one ran out. I’m so glad I went with these fabrics for the binding. I put them in a specific order so they would look and work a certain way along the rainbow front. The purple end has more purple on the binding; the middle section’s binding contains a lot of blue; and the pink end is just sort of bright and fun. I think it’s cool without being too attention-getting. Did you see my label?! Except . 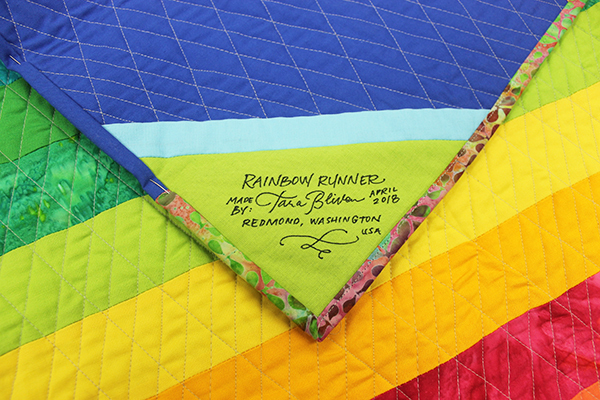 . . seeing my "Rainbow Runner" label makes me remember that I’d meant to officially call the quilt “Birth Day” instead. Oh no! Perhaps I’ll have to try adding another little “also-known-as label” on top. Why not? There’s room for some more fun there—and I still haven’t tried appliqué! I used the method from Pat Sloan’s Teach Me to Make My First Quilt to easily attach the label. I feel so accomplished. Making a quilt has been sort of a bucket-list item for me, and now that it’s complete, I absolutely love it and want to make more (mostly so I can own more quilts). Thanks so much to all you readers for your opinions, advice, and encouragement—and a special thank-you to Karen Johnson (Martingale’s Director of Marketing) for all that plus always helping me fix things whenever I went wrong during the process (!). You will probably see me pop back up in the Stitch This! blog again one day—this has been too much fun! Great job! It’s beautiful, and enjoy that feeling of accomplishment! Now get thinking about your next one–hopefully, ‘the bug has bit you!’ I love making quilts–every stage from designing to doing the label and binding. Enjoy!!! Congrats, Tara! Your runner looks wonderful on your media stand. Congratulations Tara! I love anything made with rainbow fabrics. So bright and cheery. I hope those Martingale Quilters warned you that Quilting is addictive. I look forward to seeing your next project. 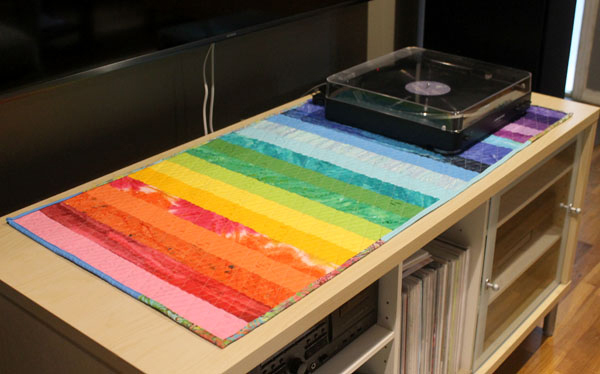 Tara, I love your finished table runner. Nice job. You did well on your quilting also so give yourself a pat on your back. I recently thought I was doing well quilting a grid on a table runner and I have to say it wasn’t even quilting when I got done. My response to it was I was “perfectly inconsistent “ and it worked for me because it was done. We are always our own worse critic because we are so connected to it. You did a wonderful job! The colors / fabrics all came together beautifully. Congrats!!! Thank you for sharing your project and thoughts in the quilting adventure. You did a great job and the runner looks fabulous! Congratulations on the first finish, may there be many more! Well done, Tara, and welcome to the joyous (and addictive) world of quilting. I can see from your runner that you love playing with colour, and quilting is one of the best ways to do that. We look forward to seeing your next project, and what direction you choose to stretch your skills and creativity. Enjoy! Congratulations Tara! Your binding choices are great and the whole runner looks wonderful! I discovered quilting when I was in my fifties. I wish I’d started when I was younger like you. You work at a great place to start your addiction to quilting! Such a beauty and Rainbow will be one you’ll use over and over again! It will bring you smiles every time you see it….wonderful work! 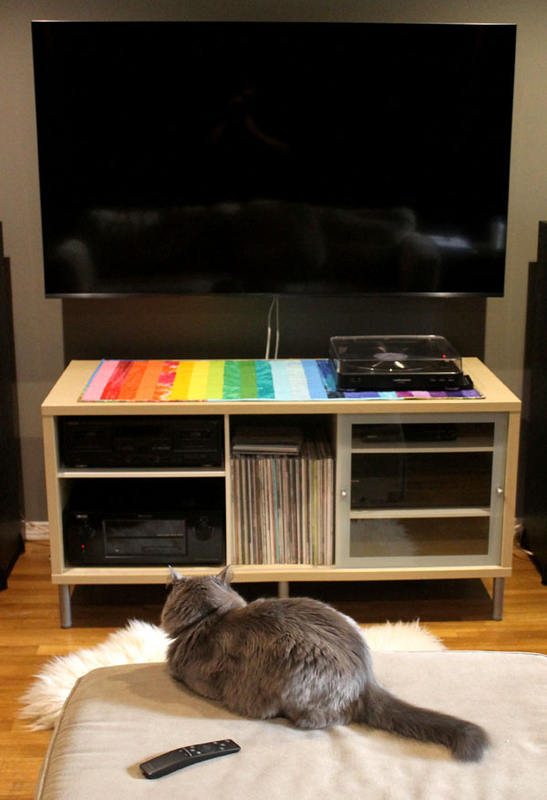 Great work-What does the cat think? Congratulations, Tara! What a great addition to your home! What’s next? Love the binding. Tara, Love the colors of the rainbow! and love the way you did the label! I want to do this on my next project. Great Job!! Beautiful work and you have a great eye for color. Congratulations. Looking forward to your next project. You did good! Great color choices, too! Congratulations! You have now joined a group of fabric loving people that get such joy from making things. You did a great job and I’ve enjoyed seeing your progress. Oh Tara, I love your color choice. You did a really lovely job. Keep up the good work. Love the little quilt, it bright and cheery and a nice size. Congrats. And hope to see your newest one soon. Congratulations Tara. Great job! Really beautiful. Like MoeWest above, I’m another quilter who started in her late 50’s. Just love it, and am glad to hear you love it too. Congrats on the Rainbow Runner. I remember the feeling of accomplishment when I finished my first baby quilt. Good luck with your quilting in the future. You are fortunate to be surrounded by experienced teachers at your workplace. Hooray for you! What an accomplishment! I hope to join you at the finish line one day. Congrats on your first quilt! You feel a sense of accomplishment when the first one is done. Well done Tara. Welcome to quilting! Congrats on your first quilt. Looks like you had a feline friend helping you get to that finish line. Congrats on such a stunning quilt. Hard to believe it is your first. Hopefully you will continue as you definitely have talent. Obviously, kitty approves of your lovely quilt! Great job! Great job Tara and I love your quilt & the colors are fantastic. Isn’t it such a great feeling seeing your first quilt finished? I hope this is just the first of many beautiful quilts you’ll be making! Looks GREAT…congratulations and welcome to "the quilt club!" That looks incredible Tara! I especially love your binding – it pulls all the fabrics together perfectly! Congratulations, Tara! You did a beautiful job. Now you get to plan and execute your next project, and the next one after that, and… you get it. Congratulations on your debut project! And is your cat a dilute tortie? He/she looks like mine from the back. Both of my dilute torties like to keep me company while I quilt. I love this kind of cat coloring. Hi Tara Good job! I just love your Rainbow Runner! Tara, What a nice quilt, isn’t it a good feeling to finish a quilt. I just finished a bed size quilt and I just want to celebrate and throw it on the bed so I can sleep under it and feels so good.